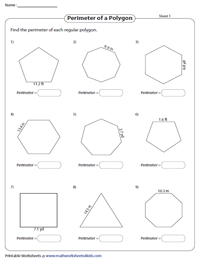 Navigate through this enormous collection of perimeter of polygons worksheets, meticulously drafted for students of grade 3 through grade 7. 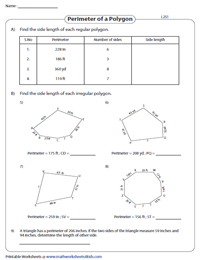 Master skills like finding the perimeter of regular and irregular polygons involving integer and decimal dimensions, find the side length using the perimeter, test your skills by solving algebraic expressions to find the side length and more. The worksheets contain two parts. Part A comprises regular polygons, while Part B features irregular polygons. 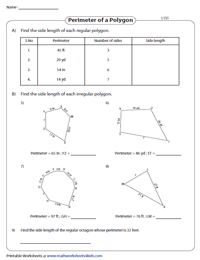 Kick-start your practice with this collection of worksheets on finding the perimeter of regular and irregular polygons. The side measures are given as integers ≤ 20. Add up all the sides to compute the perimeter. 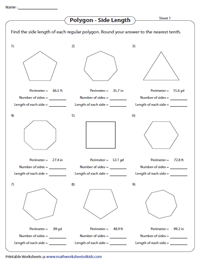 Bolster your skills in finding the perimeter of polygons whose side length is a 2-digit integer ranging between 10 and 99. Incorporated here are regular and irregular polygons presented in three different formats. 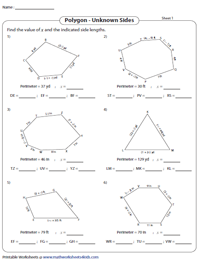 Instruct fourth-grade students to enumerate the number of sides in each regular polygon. Multiply the side length given as a decimal, with the number of sides to determine the perimeter of the regular polygons. Each worksheet presents the problems in three different formats. 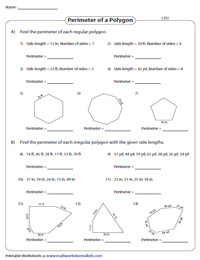 Find the side length of regular polygons and complete the table in Part A. Part B presents irregular polygons as geometrical shapes and in word format with perimeter ≤ 99. Divide the perimeter (3-digit number) by the number of sides to obtain the unknown side length of regular polygons and complete the table. Add up the side measures of each irregular polygon and subtract it from the perimeter to solve for the missing side length. Packed here are regular polygons whose perimeter is given as decimals. 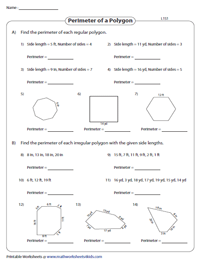 Count the number of sides in each of the polygons and divide the perimeter by the number of sides to find the side length in this set of fifth-grade polygon worksheets. The dimensions of the regular and irregular polygons are presented as algebraic expressions. Direct 6th and 7th grade students to solve for x and substitute its value in the algebraic expression to find the unknown side length.